The beekeeping industry in the Philippines could thrive as micro-enterprise Milea has modeled a successful commercial health care venture that zeroes in on bee products’ “propolis” and other antibacterial properties that promote natural healing. From a company that imports bee products from the United States through traders, Milea Bath and Body Wellness Essentials is now taking advantage of local resources on bee products manufacturing. Imported bees wax, used as raw material for natural and organic personal care products cosmetics, and pharmaceuticals, costs P 600 to P1,000 per kilo. The locally-sourced only costs P150 to P400 per kilo. Department of Agriculture noted the country imported 400 MT of honey (gathered by bees from plant nectars) in 2009 largely from Australia. Apiservices reported the Philippines’ importation of bee products totaled to more than $1 billion from 1989 until over the last few years. It indicates brisk demand locally for bees’ natural sweetener and related products. Bees wax is the natural wax that form the bee hive, the octagonal holes, or the house of honeybees. The bees also produce propolis, a resinous mixture that bees gather from flowers, tree buds and other botanical sources, enabling it to prevent diseases and block off bacterial growth in the hive. “The propolis is used as protection of bees from other predators. They use it as antiseptic in their hive to increase their immune system, but we can use it for our purpose, for human health protection,” said Dr. Cleofas Cervancia, University of the Philippines Los Banos (UPLB) project leader for Bureau of Agricultural Research (BAR)-funded apiculture program. BAR has supported UPLB’s apiculture (beekeeping) program as it recognizes that the use of natural products as a way to natural healing has now become a global trend. BAR Director Nicomedes P. Eleazar said beekeeping can generate livelihood in rural areas where there is hardly any jobs for folks that could also be protectors of farm lands and forests. The market for it is also the growing, health-conscious individuals. “We should tap our own local bee species and their by-products that have unique traits so we can market Filipino products that can capture a niche following in the global health and wellness market,” Eleazar said. 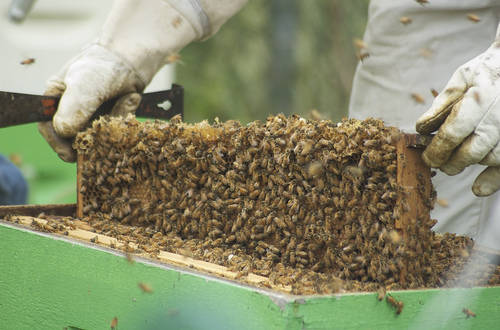 Aside from the bees wax, other beekeeping products are honey, pollen, and royal jelly. Milea’s training at UPLB-BAR bee program. Through the UPLB-BAR apiculture program, Milea founding entrepreneur Edilee Omoyon and her husband, Rico, are now sourcing bee products raw materials locally. They initially obtained honey from honey hunters in Mindoro. But they realized some honey-hunters– who wanted to do a shortcut– faked the honey. One used molasses, sugar, kalamansi, and water. That led Rico to study just in April 2010 beekeeping on his own at UPLB. They paid P6,000 for the course, and it was well worth it. Milea now keeps a trained staff who tends the bees on a daily basis. The Omoyon family is also bringing in transfer of technology in the beekeeping industry. As the UPLB course helped them find a local source of raw materials, Rico further studied Instrumental Insemination of queen bees in the United States as part of ensuring its product quality. “We’re able to breed our own queen at a controlled environment, so there’s lesser disease. We’re able to keep the lineage of the bees,” said Edilee. Milea can decide on what bee specie to propagate—for some bees are hard at work in reproduction, some are valiant at stinging, and some are prolific at wax production. Whatever trait, it is quality control that matters. With this focus on product quality, Milea has been able to expand the value of its capital from the initial P300,000 back for years ago to about P2 million at present. Having started beekeeping when the company already had a ready market, it was easier to sustain operations. Milea products are presently distributed by Sesou Nature Source in Ayala Malls (Market Market, Trinoma, Alabang Town Center , Glorietta 3, and Robinson Magnolia) and at the company’s own store, All Organic Store at the Herbal Garden, Quezon City Memorial Circle. The Omoyons started its business after Edilee retired as part of an executive team at a cosmetics company. Then, she felt the need to devote much of her time taking care of her children, one of whom, her son Itcho, had a skin asthma. “I love reading, and I came from a cosmetics company. I just found out that in some countries like Australia and in some European countries, this illness is managed naturally using natural products. That is not yet too known here in the Philippines during that time,” she said. Having found certain oils as cure for her son’s illness led the Omoyon family to use bee products and to engage in the all-natural Milea health care business. Skin asthma may be cured through a combination of oils– pili oil, avocado oil and others. Milea also uses virgin coconut oil, lemongrass, malunggay oil extract, and other essential oils as materials. Its products are now varied–baby products, balms, bath gel, body scrubs, essential oils, fight skin asthma, foot care, hair care, insect repellents, makeup tools, massage oils, mineral makeup, moisturizers, organic soaps, pimple control, and whitening products. And all of these are produced organically or free from harmful chemicals. Bee products indeed are a cure for many ills with their antibacterial, antifungal, and antiviral properties. “When you get cut, apply honey on it. You get burned in the kitchen, apply honey on it. Honey is a natural cough remedy, even if it’s honey alone. Your hair is dry, apply honey on it; you have black heads, put honey. The propolis is a cure for psoriasis in the scalp. It can eliminate flakes and itchiness,” said Edilee. But the BAR and UPLB project also sees the role of beekeeping in food security and employment. “Bee products are a high end product. Local producers are presently not able to meet local demand,” said Cervancia. Bees have the natural role in pollination of flowers for plant propagation. This is the reason why in other countries that have developed farm systems like in the United States, some farmers employ beekeeping in order to enhance productivity. Bees love the nectar of coconuts which is why some honeybees build homes in coconut plantations. As there are three million hectares of fruit-bearing coconut plantations in the country, farmers can enjoy additional earnings from beekeeping in coconut areas. Apiservices reported that a beekeeper from Tagum del Norte believed a colony of a certain specie of honeybees reported collecting eight to 10 kilos of coconut nectar a day. A coconut farmer can earn an additional P100,000 yearly by keeping bees under coconut trees. That does not reduce his income from coconut since coconuts are said to have thousands of flowerets in its inflorescence, but only really grow into fruits. The products are honey, which can sell at a high of P350 per kilo; bees wax, P500; royal jelly, P150 per 10 grams; pollen P2000 per kilo; and nucleus hive of Apis Mellifera, P4000. Together with sugarcane in a one hectare farm, a farmer can produce 2,600 to 4,000 kilos of honey. This translates to a gross income of P266,700 to P400,000 per hectare yearly at a honey price of P100 per kilo. “Local beekeepers who raise native or imported bees have no problem in marketing their produce. The demand for honey is still very high,” said Apiservices. Honey is an ingredient in health food and pharmaceutical manufacturing. While still considered a start-up in the personal care industry, Milea is now able to help Filipino farmers in the countryside. It does not only produce its own materials from bee products. It also buys other natural ingredients from other farmers. It buys from around 100 families planting lemongrass in Negros. It gets its virgin coconut oil from farmers either from Quezon or Mindanao. It is also now interested in a technology for extracting malunggay seed oil. At present, it still imports malunggay protein extract from France simply because the technology is not yet available locally. Nevertheless, it now sources at least 50 percent of its raw materials from local producers. The Philippines should also produce more essential oils in order to supply cheaper raw materials for companies like Milea. Even seemingly simple materials like siling labuyo are imported by the company. Siling labuyo is imported from other countries where the company buys at some 1,000 kilos a week through traders. Their becoming available locally at more competitive prices must now become an advocacy for Milea. “Local oils are very expensive like lemongrass oil now is P2,400 per kilo. From India, it’s only P800 per kilo,” she said. For the family’s own consumption of guaranteed organic products, it keeps a one-hectare farm in Batangas. The family plants it with herbs, aloe vera, acapulco, ginger, etc. It grows there organically-grown chicken and hogs. Even if the market for natural products in the Philippines is still small, it must have a promising growth prospect. Whenever one tries at Milea’s products, he is sure to get satisfaction. That gives the company return orders. While it believes its products are good for the general market, it cannot yet engage at once into mass production considering its current operation and financing. Besides, the market for organic products has yet to be built up. The company has also developed a preservative system that is unique, and is certified organic. With its nature-inspired and light-to-the-eye design, its packaging becomes a come-on in the market. She did the design of the label herself together with a layout artist. “We maintain a certain look,” she said. With a look that stands for high quality and elegance for its products, Milea subsequently obtained assistance for its business. It obtained in May this year a SETUP loan of P800,000 for its machines. These are for homogenizers, mixers, and plant extractor. SETUP stands for the Department of Science and Technology’s Small Enterprise Technology Upgrading Program. It also got assistance in media exposure through the Kapuso Mo Jessica Soho (KMJS) popular television program through GMA 7. The company now also has toll packers. Its machines’ capacity, while still small at 20 to 50 kilos per batch, makes a big difference in helping grow the country’s natural cosmetics industry. Its micro small enterprise keeps nine full time staff at its processing site in its factory in Las Pinas, Metro Manila. For any questions, please call Ms. Edilee Omoyon, 0917-888-8439; for interview requests, 0917-979-1629.